HVAC contractors share a common goal to generate leads for their business. Often times they are competing against contemporaries within their service area for the same customers. Traditional marketing methods like billboards and print advertising are no longer effective in achieving sustainable business growth in 2019. A newer and more intuitive marketing method has emerged onto the landscape in the form of Search Engine Optimization, known often as SEO. The objective of SEO is to rank a heating & cooling company on Google search results. Why Should HVAC Businesses Invest in SEO? Of all the promotional techniques available to contractors in 2019, none is more effective over a long period of time than SEO. It’s no coincidence that search optimization is also one of the least expensive forms of marketing for heating & cooling companies. Investing in SEO is conducive to long-term success in the form of brand development, local trust, and most importantly lead generation. 95% of HVAC companies are looking for ways to generate leads, and SEO is quite simply the most attainable and cost-efficient route towards achieving that goal. Throughout this guide you’ll learn why each element is important for search rankings and what kinds of tasks are involved in implementing them into a web presence. HVAC companies that perform well online utilize some form of each component into their internet marketing strategy. HVAC is a very local industry. Sure, there are a few national brands that provide services across the nation but even in those cases, a local hub is involved. To generate quality heating & cooling leads, one must target their local service area which is a defined radius within the general location of your business address. Google My Business and Google Maps, specifically, represent channels through which to capture coveted local leads. The two Google entities are connected to one another and have a major impact on SERPs. Aside from these two, there are also other measures that HVAC contractors can pursue to influence local search results online. Google Maps determines the location of a HVAC business and modifies results based on relative geography. Searchers in Dallas, TX for example are more likely to see results for companies in Dallas, TX. This is true both in traditional organic results, but perhaps most importantly, in the Google Maps Pack. The Local 3 Pack is a SERP feature on many transactional search queries and serves as a convenient way to push a company to the top of search results and acquire more clicks. Google Maps uses markers to define precise location. For a Google Maps listing to hold weight, it must be associated with a business, something that is achieved through Google My Business. 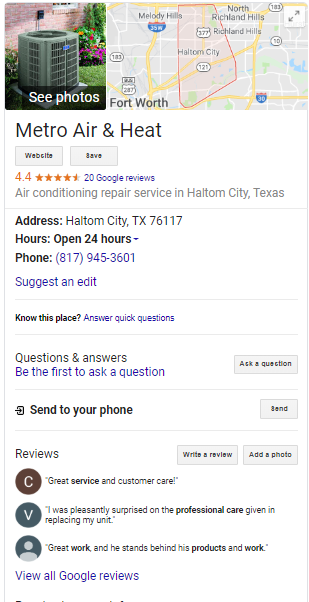 By claiming a business on Google and verifying its address via postcard, HVAC companies can literally put themselves on the map digitally. By optimizing a GMB listing, you are giving your company a greater chance of ranking on the Local Maps Pack as well as increasing the conversions of visitors who come across your business online. Optimized listings also assist in legitimizing the trust and authority of your company. Most local searchers check online reviews prior to making a purchase decision. Furthermore, Google Map Packs prioritize listings with a healthy number of reviews. So not only do reviews help increase visibility on SERPs but they also help convert customers who are in fact exposed to your listing. HVAC services become appealing to consumers when they can verify the company’s trustworthiness and conveniently contact them for a specific service. Reviews tie into Google My Business and Google Maps to consolidate all of those things in one presentation. Google is not the only platform on which reviews hold influence. 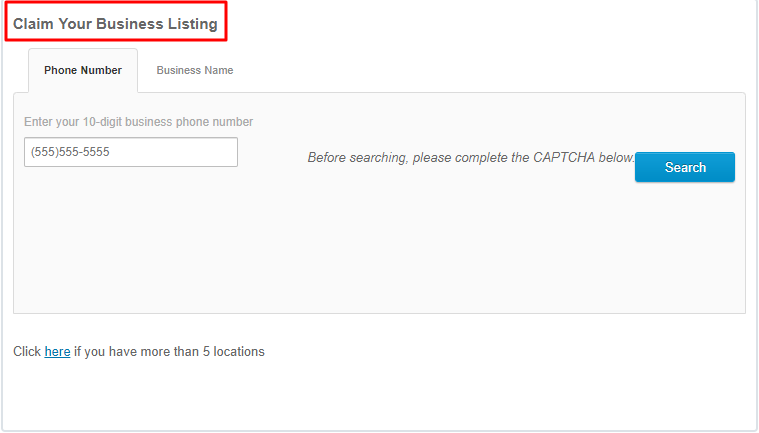 While it is considered the most important review-type because of its connection to Google Maps and Google My Business, there are several others that should be monitored in addition. These include Facebook, HomeAdvisor, and Yelp to name a few. While you might look at Facebook as a social media network first and foremost, its popularity makes feedback more likely to be witnessed by prospective clients. Facebook supports business pages and has a verified review system. Keywords are a touchy subject in SEO for local businesses. The search volume collected from sources like MOZ and SEMRush are on a national level but there are a few ways to specify local intent. For example, a search of dallas ac repair provides a greater indicator of interest within the Dallas area than if the query had simply been ac repair. 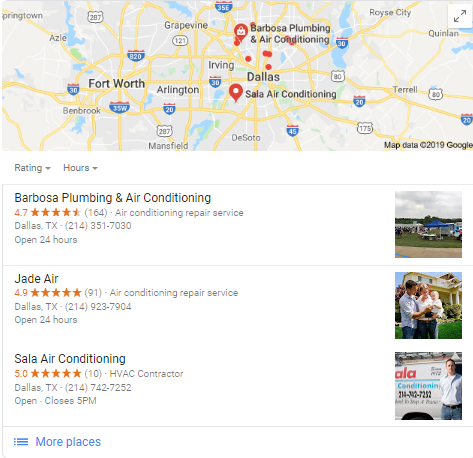 By extending the keyword with a local identifier i.e dallas, HVAC companies can better understand local search intent and need. These keywords can then be implemented within content, title tags, URLs and other SEO elements. There’s countless business directories that exist online and they expand far beyond Google and Facebook. A known local SEO factor is the consistency and uniformity of contact information across these range of platforms. NAP stands for name, address, and phone number which have long been a signal of local trust. Directories pull their information from data mining sources like Acxiom which collect information from public records. Editing NAP information at the source (the data miners) can ensure it is properly distributed. You can also go through each listing individually. When you think about SEO, you often think about changes made to your own web properties, especially your HVAC company website. But the truth is that many ranking factors involve elements that exist away from your main website. 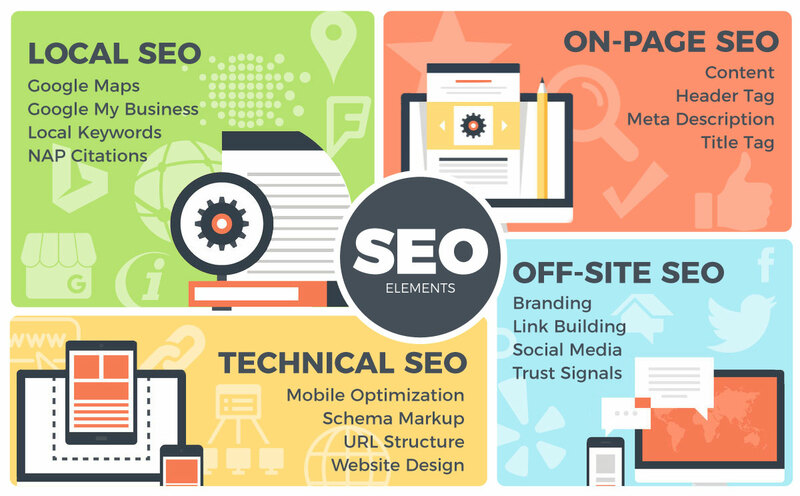 The optimization of these elements is known collectively as Off-Site SEO. There is some crossover between local and Off-Site SEO because NAP citations for example are a perfect example of off-page optimization elements. Any time an external domain is sending an inbound link or signal to one or more of your web properties, it can have an impact. Luckily there are measures contractors can take to improve Off-Site SEO. 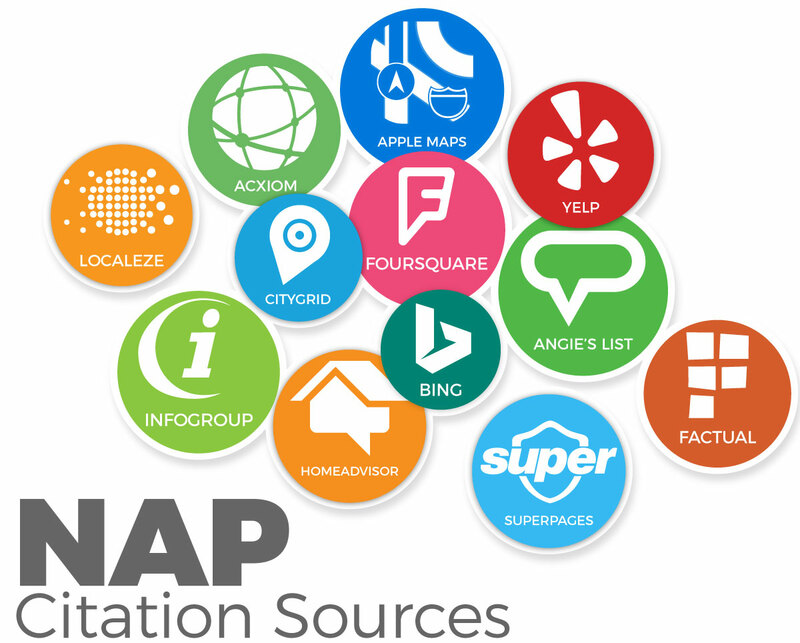 NAP citations are part of local SEO but also off-site SEO. Citations come from external domains and if properly optimized showcase a link to your company website. This link is observed by Google as inbound. Although it is a NoFollow link, which means it doesn’t hold a great deal of link equity, it is still important enough to have a general influence over your web presence. While a single citation won’t do much for your SEO, enough of them will begin to make a collective impact that can translate into improved search rankings and greater authority and trust online. Contrary to what many say about links, they heavily influence search rankings. It can be a tricky terrain to navigate for HVAC companies because link building often blurs the lines between white-hat and black-hat SEO. For those that don’t know the difference, black-hat SEO refers to manipulative SEO tactics while white-hat refers to straightforward and Google-approved methods. There are white-hat ways to build links and that’s what will be discussed in this guide. Engaging in black-hat methods can be dangerous for HVAC company websites. Spam links from blog comment sections for example, can prompt Google to manually penalize your site. There’s no shortage of legitimate link building opportunities for HVAC companies. Not all links carry the same equity however. NoFollow links are those that are established on business directories and social media networks. DoFollow links in contrast are secured on website pages within the body content, including on blog posts. DoFollow links carry more link equity, meaning they more heavily influence search ranking. NoFollow links can still hold value despite a lesser equity. NoFollow opportunities are plentiful since anyone can claim a business listing or share a blog post through social media. DoFollow chances are more difficult to find, but creating great content assets that are worthy of links is a great place to start. Since anyone can publish their website on their own social media page, Google can’t put the same equity in these links when ranking pages. These links are established by the company themselves and therefore are not a true indicator of endorsement or trust from a separate entity. Still, they do reveal at least that you as an HVAC company are active on platforms including business directories and social media networks and therefore still hold value. MOZ lists several of these link types on their local ranking factors study. Best of all, they are easy to establish because you can embed them manually. Links that require another person or company to cite your website or other web entity are known as DoFollow links. These types of links are the premium currency for online authority building. Since they cannot simply be added manually, they hold greater link equity. Someone going out of their way to link to your content, listing, or page, shows that it is providing value to their own visitors. These links are endorsements so to speak and therefore are naturally dependent on the quality of the domain that is linking to you. Ways to build DoFollow links include blogger outreach and content marketing. There’s many social platforms through which to grow your HVAC brand off-page and it’s not just about link building. Many of your customers and potential future clients are using social media everyday. Whether it is Facebook, Instagram, LinkedIn, Twitter, or YouTube, they are frequenting one or more of these networks everyday. Social media signals are considered a local search ranking factor but they also indirectly influence brand recognition, trust, and other qualities that help solidify HVAC companies within their local communities. They can even be a source of lead generation in best case scenarios. The process of optimizing your HVAC company website is known as On-Page SEO. Because the actions take place on-page, you have a greater control of them than you do with off-site SEO. When people think about SEO they often think about on-page elements, specifically the usage of keywords within content, headers, and titles. To properly implement On-Page SEO, preparation is required. Website optimization should start with research (competition, keywords, etc.) and then follow with a strategy which can later be implemented through tags, urls, etc. The overall presentation of a website, including content quality, is also considered an On-Page SEO factor. Google discourages keyword stuffing, making content quality an important on-page factor. Although keywords must be included within pages, they can’t be at the expense of quality. Every page of content (blog posts included) should provide value to the reader. 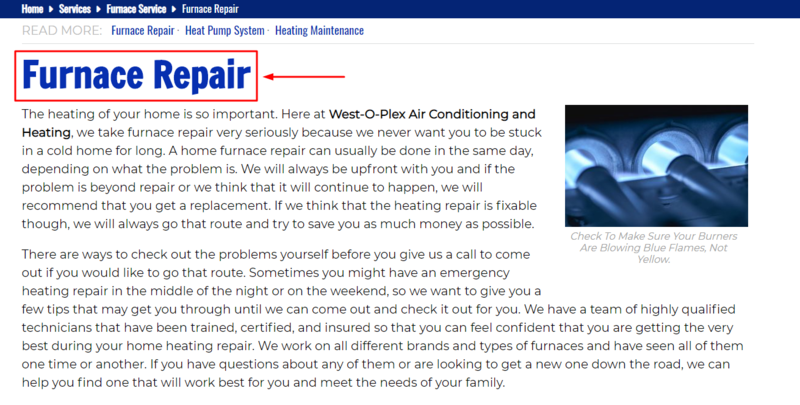 As an HVAC company who offers gas furnace repair services, the corresponding page should inform the visitor and help them understand why you can perform the service for them. It should also include a call to action (CTA) and make it reaching your office phone line extremely convenient. All content should pass Copyscape to prevent duplication. Headers have also been important for SEO because they organize content and provide Google with a clear indicator of what the content is about. Headers are categorized by number. H1s are the largest headers and also the ones that carry the most weight for SEO. H2s are also important not just for SEO but for content organization. H3s and above are more about formatting than they are SEO but since they can improve the user’s experience, can still have an indirect influence over search rankings. Headers should ideally include keywords but maintain relevance and readability. Images are an often overlooked SEO element but carry significant weight in Google’s eyes. The optimal process in using images for web is renaming the file to match its relevance and using lowercase letters and dashes. For example an image showing your HVAC company truck would be hvac-company-truck.jpg. This file would then be uploaded to the server, embedded on the page, and tagged with Alt Text. For those unaware, Alt Text is a description of the image. In this case it would be as simple as renaming the file in title case lettering. So HVAC Company Truck would suffice. Make sure photos are not too large or they will slow down loading speeds. Keywords can be researched using MOZ and SEMRush and then inserted within on-page elements. The best keywords have high volume and relatively low competition. But most importantly, they are relevant to your HVAC company and indicate a user intent that is appropriate for your website. The goal is to attract relevant consumers who are looking for heating & cooling services in your area. Keywords should be placed within content, images alt text, meta descriptions, and title tags. Remember to avoid keyword stuffing and implement LSI keywords for semantic search. Google tends to favor sites that have a wide span of relevant terms within the content. A meta description is a brief summary of a page and should accurately describe to users what they are clicking on. Optimal descriptions are 120-158 characters or 920 pixels as of 2019. A meta description should include the primary target keyword but not more than once. 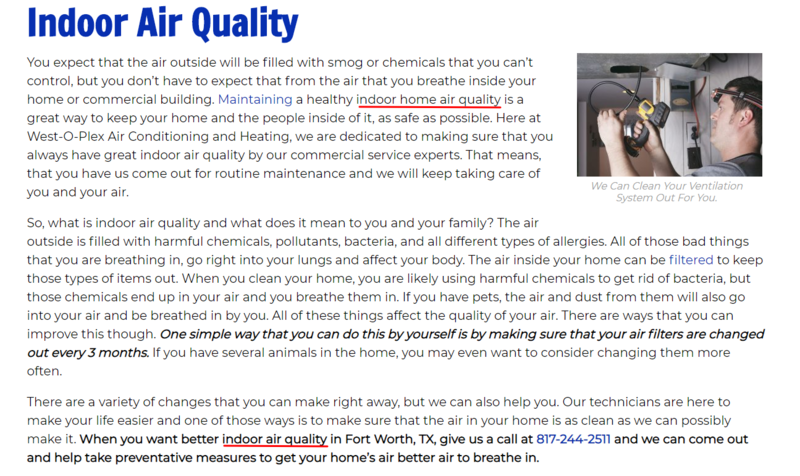 Just like with page content, stuffing keywords into a meta description is discouraged by Google and can hurt your HVAC website’s overall SEO. As a local business, don’t be afraid to include a phone number within your meta description either. It gives the users the option to call you right away. SEO titles are a user’s first look at your web page. They are the blue links you see on organic results from a Google search. Titles should focus on click through rate, keywords, and relevance. In some cases, branding your title tag is also appropriate. 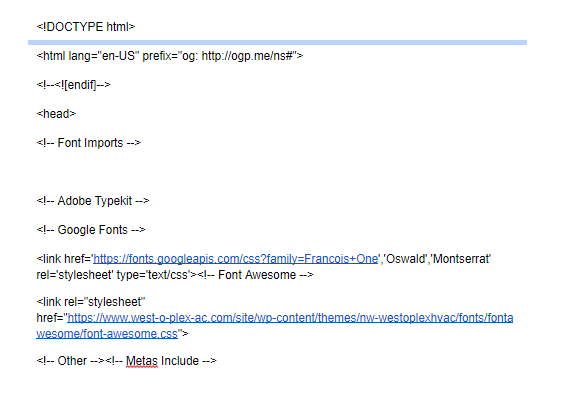 An optimal title tag is between 50-60 characters and can be checked with MOZ’s Title Tag Preview Tool. Keywords are most effective when they are the first part of an SEO title. The keyword can be followed with a sales pitch of sorts which can improve click through rate, or a branded term like your company’s name. Remember too that each page has its own title tag, and they should all be unique. Some aspects of SEO are not plainly visible to the user. These elements either exist behind the scenes or somewhere that users don’t normally consider. Collectively, these technical components of search optimization are known as Technical SEO. They are often fundamental to the success of a website and have to do with its construction and operation. Everything from codebase to URL structure is considered part of Technical SEO. While some aspects are not difficult to adjust, most technical optimization requires knowledge of CSS, HTML, and website design. Technical elements often influence search rankings in more than one way. A clean and SEO-friendly codebase goes a long way towards improving the ability to rank on Google. CSS and HTML are the most common forms of coding and are languages in of themselves. Not just anyone can write code because it requires extensive knowledge of programming. Template websites often use blocked code that bogs down a website and limits customization. In contrast, from-scratch or “custom” websites are written with unique code that can be altered in any way necessary to improve SEO and create the best possible presentation. Make sure your site is backed up before editing code. Most visitors of your HVAC website in 2019 will be arriving on a mobile device. With this in mind, the site itself must be mobile-optimized. That means the display must meet the needs of mobile users and the navigation as well. Google’s recent Mobile-First Index rollout demonstrates their prioritization of websites that meet the needs of mobile users. This can include anything from display to speed and everything in between. A call to action for example can improve mobile-friendliness. A clickable phone number that links the mobile device to your phone line is a common and poignant example. A microdata language developed by schema.org helps Google parcel websites more effectively and subsequently promote them to the right searchers. The action of applying schema code to a website element is known as “marking up” hence the name schema markup. Insertions of these microdata tags are highly appreciated by Google and makes their crawling process much simpler and much more effective. Just about any type of data can be marked up with schema. Everything from your HVAC company’s contact information to the service type is fair game. As attention spans have grown shorter, the need for faster websites has increased. Websites that are fast generally rank higher because users stick around instead of exiting immediately. Sites that don’t load within 3 seconds can expect to lose at least half of their would-be visitors, a number that is frankly conservative in nature. The likelihood is that the vast majority of users in 2019 will exit slow-loading sites, especially on mobile devices. 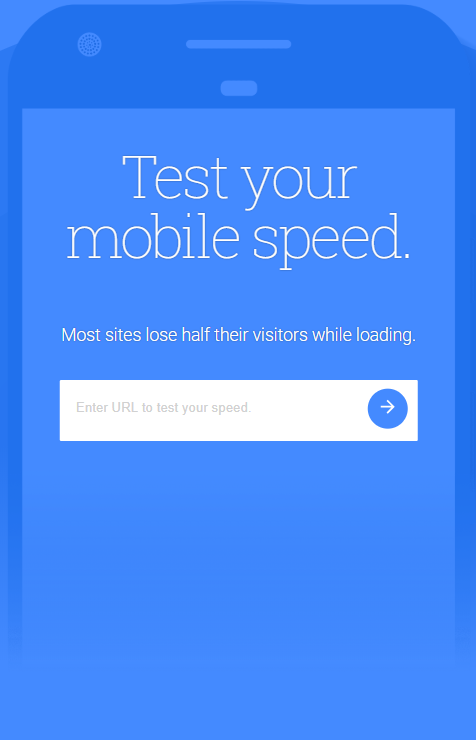 Google offers tools like PageSpeed Insights and Test Your Mobile Site Speed to help contractors gauge their site’s current speed. When Google crawls a page they are looking for a logical and hierarchical URL structure. As an HVAC company, this means breaking down service pages into categories. 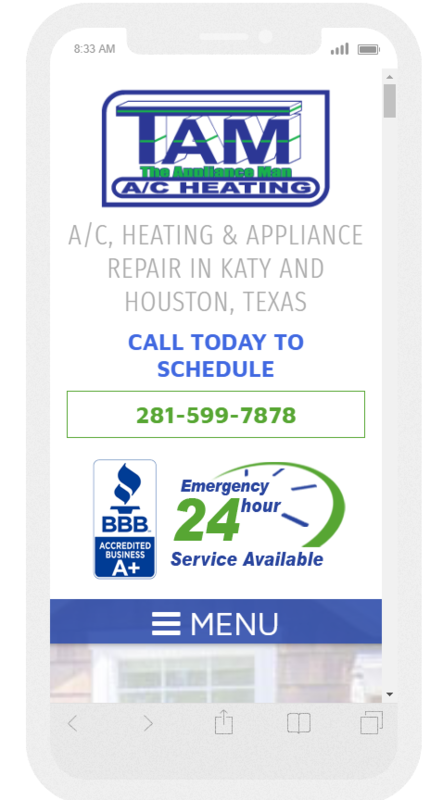 If you provide both AC and Heating for example, each could be a top-level category (parent page) while specific services like AC Repair and Furnace Maintenance can be lower-level categories (child pages) to their respective parents. When URLs are properly structured, users can more conveniently navigate the site, and Google can more easily crawl it. That makes it a win-win for contractors. Design matters for SEO both from an aesthetic and technical standpoint. How users perceive a website will influence their behavior which influences metrics that Google uses to determine search rankings. For example, a site with an appealing homepage and a clear call to action is more likely to keep users on the site longer than one without those qualities. That being said, the front-end of a website is really only half of its value. The back-end involves the codebase previously discussed and can impact SEO just as much as display, if not more so. Below we will outline some of the most popular tools in each one of these categories. 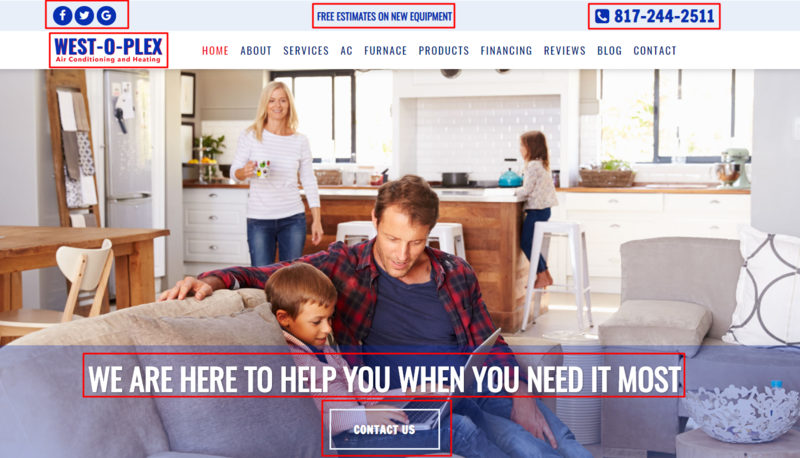 HVAC companies can take advantage of some of these tools for free while others will require a financial investment either in the tools themselves or a marketing firm who deploys them. Applying SEO is much easier with a Content Management System (CMS) which makes the process much simpler. Many of the most popular CMS’s are intuitive and user-friendly. They also allow people without extensive knowledge of coding to insert certain SEO elements. Keep in mind however that a truly custom website, will still require unique coding, even with a powerful CMS on your side. Some of the most popular software on the market today includes Drupal, Joomla, and the most prominent of all of them; WordPress. The majority of websites on the internet today are using WordPress in some capacity. It is something to consider going forward. 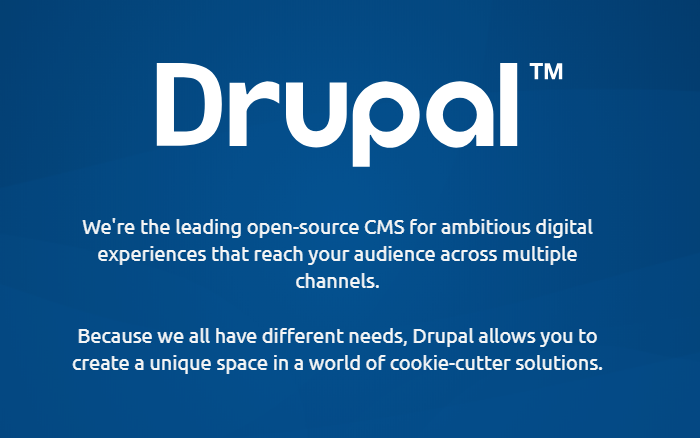 Drupal is an open source CMS available free of charge. Although it is used on less than 3% of existing websites, many of them are among the most elite. For example, Drupal is used on many corporate and government-level websites and blogs. It is distributed under the General Public License (GNU). Drupal offers users the ability to manage content including meta descriptions, title tags, and more. It is considered one of the top available alternatives to WordPress in 2019. Drupal has a large community of open source developers for plugin development. Like Drupal, Joomla is a free and open source content management system. It is specifically designed for publishing web content and has won several awards for its convenience and usability. The estimated usage of Joomla on existing websites is very similar to Drupal at around 3%. Business websites (including HVAC) seem to be the most common users of Joomla with it making up 9% of existing business sites. Joomla provides SEO out of the box, meaning its structure is conducive to favorable optimization, even without an in-depth knowledge of the requirements. WordPress is the most popular CMS on the market by a large margin. Conflicting reports of its actual market share exist, but it’s likely that the web-based software is used on more than 50% of all existing websites. That is absurd when you consider the amount of websites published each day. WordPress is open source like Drupal and Joomla and is widely considered to most user-friendly CMS on the market. It makes everything from on-page to technical SEO tasks seem easy. Although WordPress was once most commonly associated with blogs, today it is considered the standard for any website. Keywords are arguably the basis for everything SEO aims to accomplish. Without targeting specific users, an SEO strategy is largely irrelevant. Keyword research helps define that target by providing search volume, difficulty, and competition. There’s several paid options for detailed keyword research tools available on the market, as well as some free ones that offer similar value. Countless websites have found success on Google by identifying high opportunity keywords and there’s no reason why your HVAC company can’t be next in line for 2019. Having the tools is very helpful for keyword research, but knowing what to target is equally as crucial. MOZ is a powerhouse in the SEO industry and their keyword research tool; Keyword Explorer is one of the reasons why. Not only does this tool provide search volume but it also showcases difficulty and priority. You will notice strong variations in volume from one tool to the next but MOZ is generally considered one of the more accurate indicators of true search volume. Other tools use data collected from PPC campaigns to inform their final numbers, which can be misleading to contractors who are looking for organic SEO keywords. MOZ charges a monthly fee for their entire suite of tools, including the Keyword Explorer. 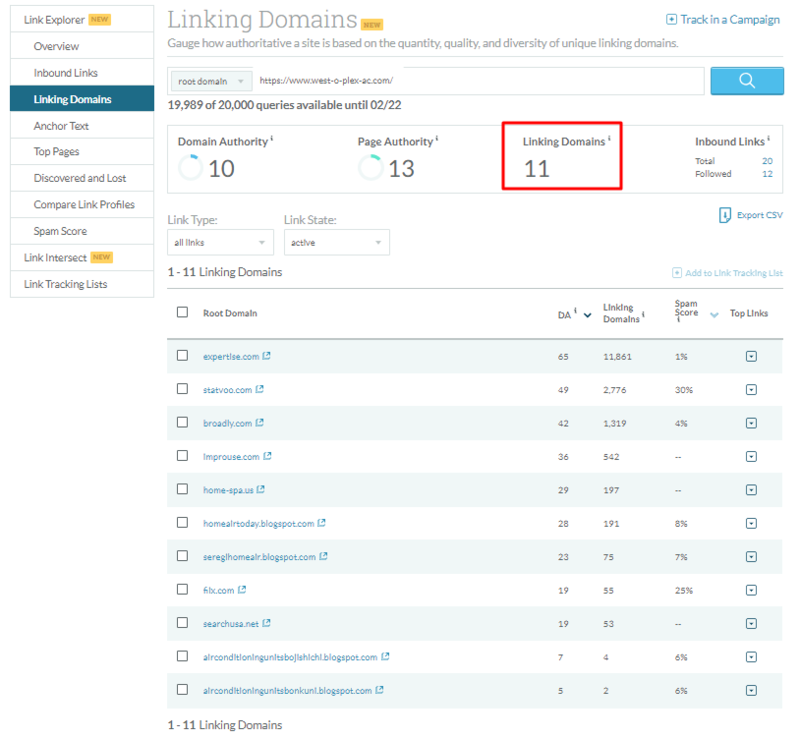 SEMRush is a paid option which like MOZ provides more than just a keyword research tool. What it is most known for however is its keyword research tool known as Keyword Overview. In fact, SEMRush is the most commonly used tool to define keywords in terms of volume, competition, and opportunity. 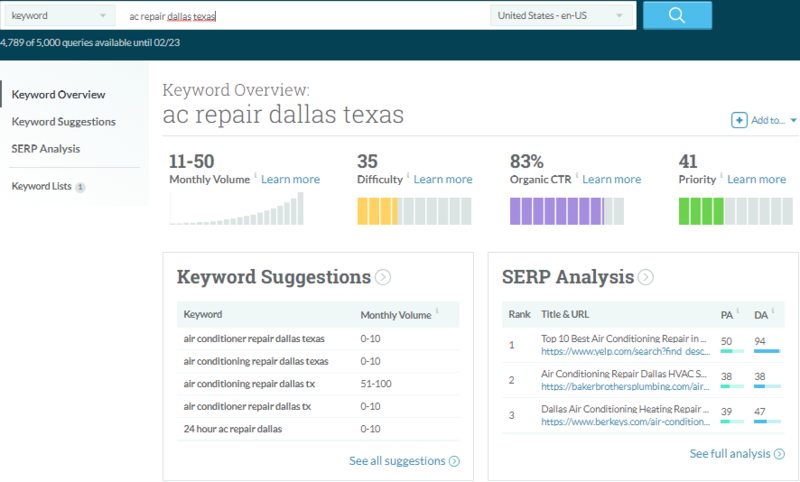 For example, their research of the term ac repair near me shows 12.1 K monthly searches with a keyword difficulty of over 60%. This indicates a high volume keyword that is also rather difficult to rank for. It is still attainable with the right strategy in place. Don’t have the money to invest in a keyword tool? Use Neil Patel’s UberSuggest which is basically a free version of SEMRush. The number on this tool cannot be considered as accurate as its paid alternatives but it certainly provides a general idea of a keyword’s relative popularity. To show the contrast between SEMRush and UberSuggest, the latter shows 27.1 K volume while the former shows the aforementioned 12.1K. UberSuggest also lists SEO difficulty and projects the chances of ranking in the top 20 for the keyword which in this case is 69%. The ultimate goal of SEO is to generate leads for HVAC contractors but it’s nice to know the data behind why you are or are not achieving your objectives. In 2019, there’s a myriad of ways to track website performance, social media performance, and more. There’s never been more tools at the disposal of companies with websites or the agencies that represent them. 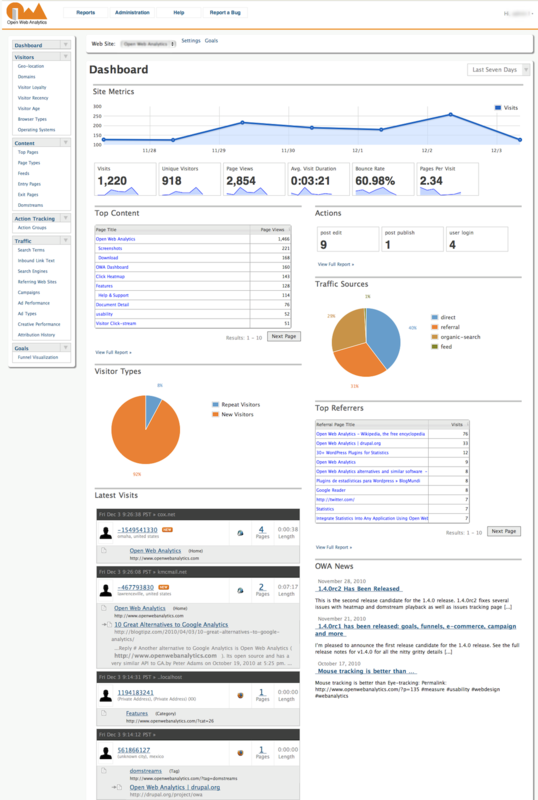 Many of these tools are available free of charge with Google Analytics being the most renowned example of this. Aside from measuring the data behind success or failure in digital marketing, performance trackers also identify both problems and more importantly, solutions to help campaigns find their footing and improve their process to get them on the right path to success. Google Analytics is the most valuable performance tracking tool available because it comes straight from the source; Google themselves. Best of all it is free for anyone to use, so HVAC companies can install the tracking code on their website and begin to track all kinds of data, generate reports, and create measurable goals. Once installed, Analytics can reveal the number of organic clicks your website is receiving, the top pages visited, and all kinds of other useful data. The tool is also highly customizable so that data that’s most important to you can be highlighted. MOZ Campaigns are part of the MOZ Pro SEO Suite which also includes the aforementioned Keyword Explorer. The campaign feature allows contractors to rack their website much like they can Google Analytics but also provides additional features that are useful to defining success. One such example of this is link tracking and domain authority. MOZ measures inbound links and their collective authority as it pertains to search ranking influence. 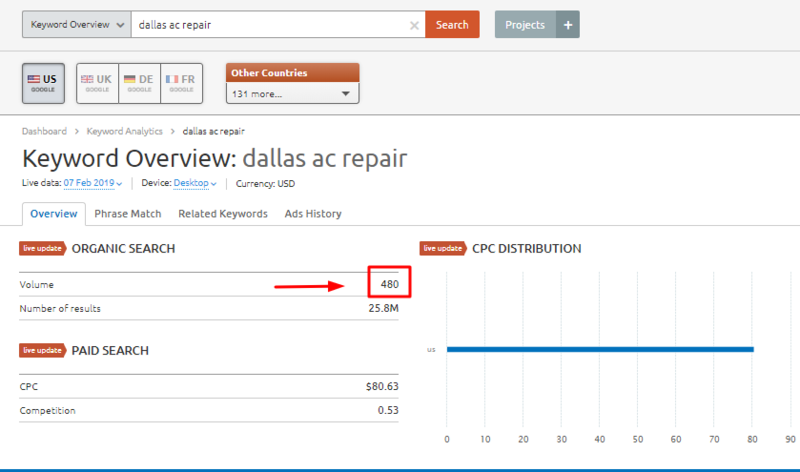 Other campaign tracking focuses include historical keyword tracking which allows HVAC companies to notice spikes and drops in keyword rankings over the duration of their campaign, which can be years and decades. MOZ Campaigns can connect directly to your Google Analytics tracking as well for an even more informative tracking experience. Throughout this guide we’ve mentioned marketing agencies as a possible solution to many of the challenges HVAC contractors face in 2019. Dallas Fort Worth SEO is the top Dallas SEO agency and can assist companies across the DFW Metroplex. With a team of 20 employees, diversely skilled in the full range of marketing specialties, we can provide a value to HVAC companies that few can compete with. Our expertise includes on-page SEO, off-site SEO, website design, content marketing, and reputation management. For a one-stop solution to all of your digital marketing needs, there is no superior choice to Dallas Fort Worth SEO. We work with contractors in Arlington, Dallas, Fort Worth, Frisco, Irving, Plano, and more. 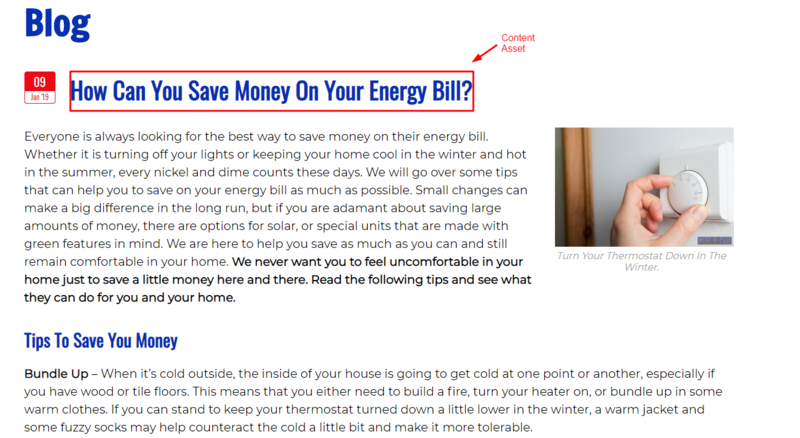 Where do you go to find white-SEO content for your HVAC website? DFW SEO is the answer. We have a full staff of professional writers including an editor who reviews all pages prior to publication. 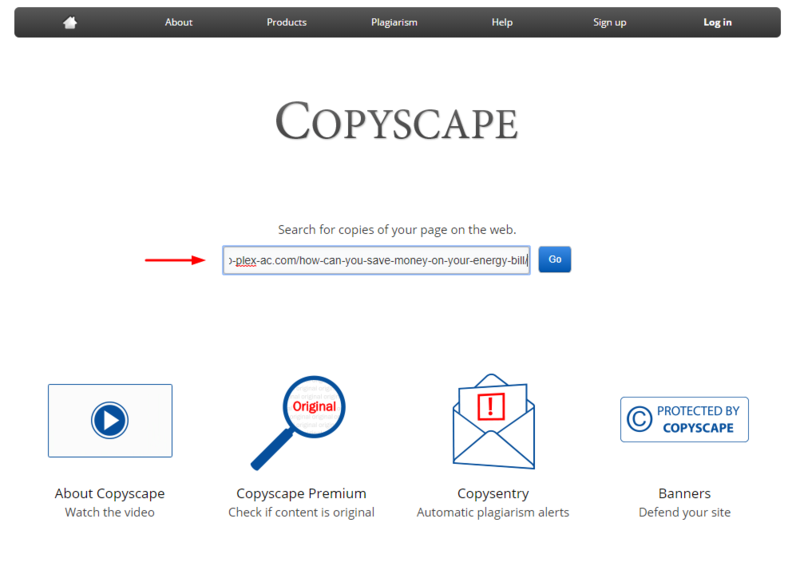 Each page passes Copyscape before being published and follows a predefined SEO strategy. Our writers are trained in the latest SEO best practices to ensure that sites are in the best position to rank Google search results. Pages are written for each of your services so that you can rank for a wide variety of keywords rather than only the primary terms within the industry. Many of the niche terms that other sites don’t write about, can be quickly ranked for on Google. In this guide HVAC companies learned about the importance of custom design for SEO. Dallas Fort Worth SEO offers custom websites for each client, designed by a true professional. We integrate your company logo, color scheme, and original pictures (you provide to us) to create an appealing and conversion-friendly lead generator. Our sites utilize responsive design to ensure their mobile-friendliness and display calls to action to increase conversion rates on each page. Our protocol requires that your website is checked every 15 minutes for server connectivity and is backed up weekly to avoid the repercussions of any unfortunate and unforeseen errors. Our goal is to rank your website #1 for as many terms as possible. We don’t go only for primary keywords but instead for any terms that can get people onto your website and ready to call. For this reason, we focus on terms with buyer intent and implement them into your SEO strategy. Each of our clients is fully analyzed prior to developing the strategy so that our goals are aligned and we are on the same page. We then incorporate on-page, off-site, and local SEO to give contractors the best opportunity to rank on Google for high conversion keywords. Our typical clients begin to see results within a month of working with us. Part of how quickly you rank will of course depend on market competition and the age of your domain. Keep in mind though that even new websites can rank for less competitive keywords if properly optimized. Our native reviews widget; Righteous Reviews makes managing online reputation easier than ever before. The power of this plugin cannot be understated. Not only does it populate real-time reviews from the most authoritative 3rd party platforms (Google, Facebook, etc.) but it provides convenience to customers who don’t have time for a complicated review process. The widget creates a Review Us link directly on your homepage and also sends text reminders with links to customers who agreed to leave feedback. 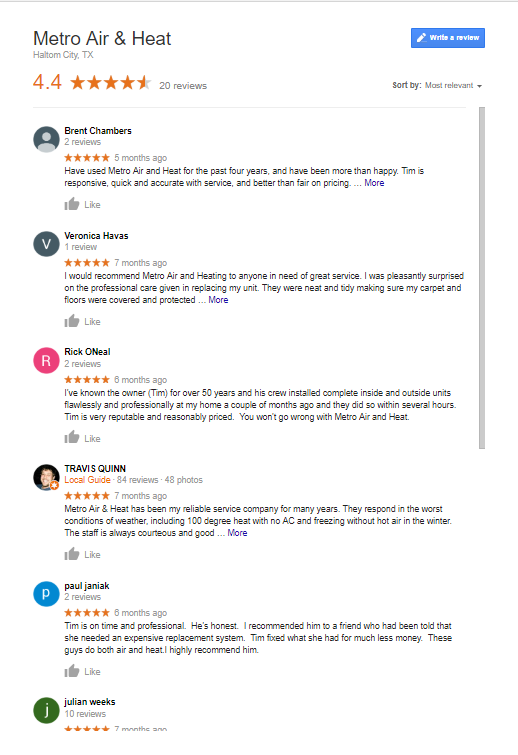 The Righteous Review plugin from Dallas Fort Worth SEO is something that consumers have never before experienced, and is something every HVAC company should pursue immediately.